The Ski Story: I. Fear. Deer. Oh and I hope your heaven smells like the post office. :-) Love you and miss you Mimi!!! Thanks a LOT! Now I have to be afraid of hitting a deer, too, and I live in WISCONSIN. Hello? Deer-hitting capital of the USA...or something like that. Yikes. Reminds me of the time a deer hit the side of my car. I pulled over and walked back to it; poor thing, lying there, looking all pathetic. And then the danged thing LEAPED UP and took off into the woods; scared the CRAP out of me! Deer are scary scary creatures! 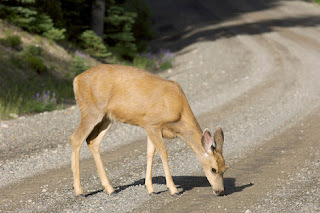 I mean, I'd rather come across a deer than a bear but still deer cause more deaths than bears or other wild animal. SCARY!!! !